In an earlier post I talked about how monads arise from free algebras. Let me recap a bit. In Part 1 I described algebras. They're sets with operations on them satisfying some laws. We can build new elements of an algebra from old ones by using its operations. Eg. 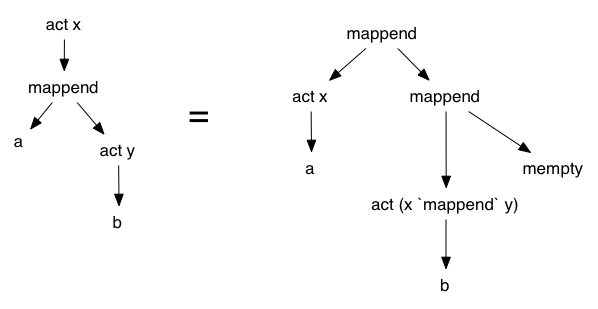 if x and y are in an algebra then x `mappend` y must be in it too. Starting with a bunch of symbols, thought of as leaves, we can consider the set of all expressions trees we can build from them. If we consider pairs of trees to be equivalent if the laws say the corresponding expressions are equal, then the set of trees itself forms an algebra known as a free algebra (for the given theory). We can do exactly the same for -sets. Something miraculous just happened though it may have been lost in the details. We combined the list monad and the writer monad to get a new monad. We did it without using monad transformers and without specifying an order for the two monads. It just so happens in this case that the result was the same as using a monad transformer. We can try other products of theories. It's tricky to deal with a theory combined with itself because repeating a type class in a context doesn't do anything. We need to make another type class that looks exactly like MSet but with different names. The result is that the product of the theory of -sets and the theory of -sets is the theory of -sets. This agrees with what we'd get from using monad transformers. It also agrees with intuition. -sets correspond to the effect of accumulating data in a monoid. The product theory corresponds to using two accumulators simultaneously. To form the product of two theories we add in extra laws to ensure commutativity. If we don't add in such laws we get the sum of two theories. For the example theories I used here these theories can lead to quite complex types. For example the sum of the theory of -sets and -sets is, I think, the theory of -sets where is the "free product" of monoids. I this is a bit of a messy object from the perspective of types. Other effects, however, may behave nicely with respect to . I haven't yet investigated. If you don't mind computing the relevant types by hand there are perfectly good alternative to monad transformers for combining effects. But it seems very difficult to automatically combine theories. In fact, I expect finding canonical forms for the elements of free algebras for a product theory isn't even computable. So this approach isn't going to replace monad transformers any time soon. Make a multiplication table showing the result of forming the product of algebras for lots of useful effects. Am I correct in understanding that having the compatibility conditions (as opposed to none) is in practice always what you want when combining monadic effects? Are there any examples where you'd naturally not want them, or where you'd want ad hoc compatibility conditions? When you say "Leaf x1 `mappend` (Leaf x2 `mappend` (... mempty))" do you mean (lowercase) "leaf"? We did? I haven't noticed. At least, I can't see an "instance Monad" anywhere. Oh, maybe you mean that FreeMMonoid is also a monad? That's obviously true, but your claim that "the result was the same as using a monad transformer" is far from being true. FreeMMonoid is just a special case of a continuation monad (yes, I know, you've tried to hide this "a -> b" extra argument, but you didn't hide it well enough). It's a pretty useful trick, but it's NOT similar to anything like "WriterT w ". And this trick is not for monads only; you can combine pretty much everything in this way. Also, Lawvere theories? That seems to be a HUGE overkill for that simple trick. 1) You've created some "combined monad" (I'll get to that part in a moment). 2) You showed that for any monad that satisfies some properties, there is a very natural map from your combined monad to that one. 3) You've discovered that a WriterT  monad satisfies said properties. 4) So, you have a map from your combined monad to WriterT . So far so good. 5) Based on that, you claim that your monad and WriterT  are essentially the same. Sorry, but I don't buy it. There is just a map from one thing to another, it doesn't make them even remotely similar. > the goal is to combine effects, not monads. Well, you've explicitly said that you combined monads. As for the construction of this "combined monad"... It's just a way to turn everything to anything. Whenever you have some type Foo, and you think "oh, how lovely it would be if it was an instance of class Bar", well, your last resort is to use continuations, defining newtype FooBar = FooBar (forall a. Bar a => (Foo -> a) -> a). Sure, it's a neat trick... but also a kind of admitting defeat, since it's so universal. It's kind of saying "I can't do it properly, but I'll do it anyway". Not that I've never done it myself - of course I did. But it's not justified by mentioning some clever theory (Lawvere theories this time) and then throwing away almost all of it (laws, this time). It feels like... cheating. Maybe I haven't made something clear. I don't care about those FreeX types. They're just intermediate steps in the construction. The thing I want is the quotient. The FreeX types are just ways to construct the sets of arrows we need. But those types are useless for implementing effects without the quotient. I most certainly do admit defeat in the sense that I can't write code to automatically construct the appropriate quotient. But I can do it manually and that's what I illustrated. I'm not using Lawvere theories to justify anything. I constructed the types for the combined effect by reading a paper on Lawvere theories and finding the closest approximating Haskell code. I then noticed that the construction, for this case, gave the same result as using monad transformers for the two effects. That doesn't necessarily happen every time. You can combine any two type classes described by algebraic laws this way. In some sense it's universal, but not all type classes are described by algebraic laws. That's not a trivial observation. I thought that you could verify monad transformers were implemented correctly by checking the monad transformer laws, which are just the functor laws from the lower monad's Kleisli category to the higher monad's Kleisli category. @Gabriel Is there any guarantee of uniqueness, though?